In the coming kingdom, Jerusalem will be the capital of the world. We aren't there yet, but I was reminded of that future hope and glory yesterday when the American president, Donald Trump, recognized Jerusalem as Israel’s capital. This change in American policy comes despite opposition from many Arab and European leaders and decades of American presidents avoiding the issue. 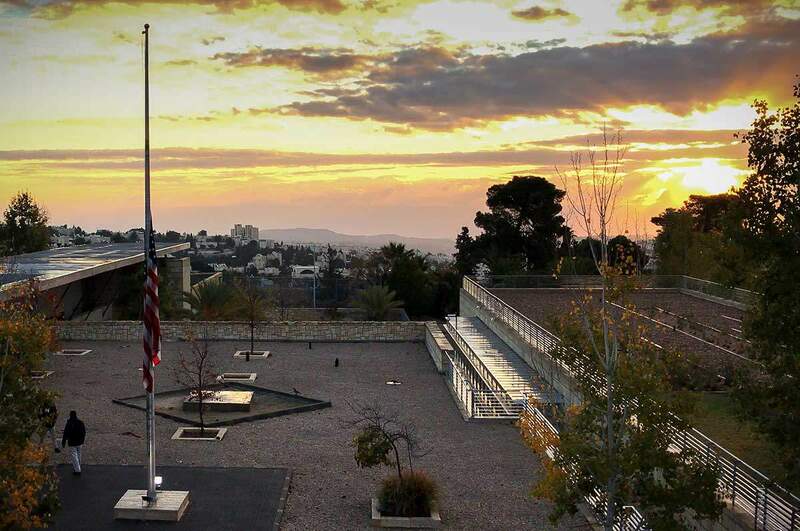 Early this morning, I went past the location designated for the future US Embassy in Jersusalem and took this photograph. I actually live in the neighborhood. It's just a couple of blocks from our home. This location may change—most likely not—but this was what it looked like this morning. Personally, I have mixed feelings about the decision. On the one hand, this is something that should have happened a long time ago. It should have happened in 1967. On the other hand, I am concerned over the practical ramifications on our soldiers, citizens, and the Palestinian people. We just received a notice from Israeli authorities warning us of the possibility of a large-scale terrorist attack on Friday in reprisal for the American announcement. Just to bring our constituents and readers up to speed on this historic moment, I had our staff put together a summary of the situation: just the facts. In a televised speech on Wednesday, President Trump recognized Jerusalem as Israel’s capital despite opposition from many Arab and European leaders and decades of U.S. policy. 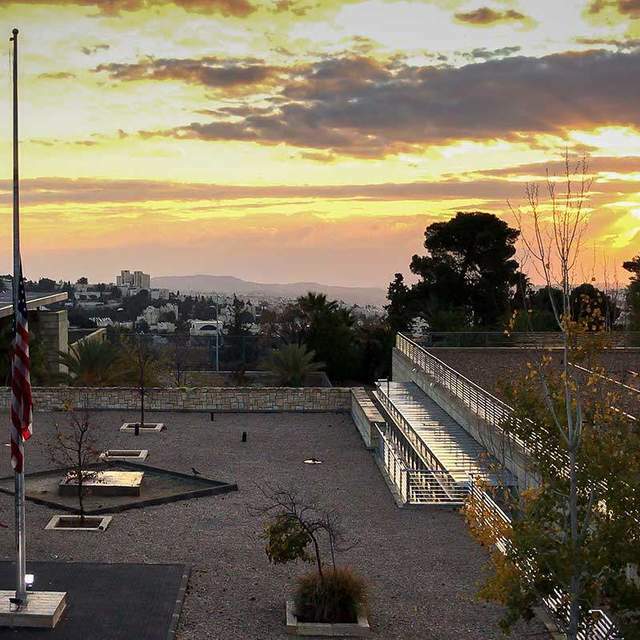 The U.S. embassy to Israel is in Tel Aviv, but as required by U.S. law, will be moved to Jerusalem under the president’s instruction. Moving the embassy is a process that is likely to take years, and it is unclear when the move will begin, if at all, given that U.S. policy may change before preparations are completed. Even though the logistics of recognizing Jerusalem as the capital are still in the works, the global impact is already being felt. Trump justified his decision as a “recognition of reality,” and also “the right thing to do.” He said it is an essential step in the peace process for the Middle East. Israeli Prime Minister, Benjamin Netanyahu, who had stayed quiet prior to the anticipated announcement, praised Trump’s decision with a video statement on Twitter: "Jerusalem has been the capital of the Jewish people for 3,000 years," Netanyahu said. “There is no peace that doesn't include Jerusalem as the capital of the State of Israel." Netanyahu also called on other nations to follow the U.S.’ example and assured that the status quo of the holy sites would remain unchanged allowing for worship from Jews, Muslims, and Christians. This move, however, was harshly criticized by a chorus of world leaders who saw it as a provocation that could inflame the Middle East rather than a step toward peace. Germany’s chancellor Angela Merkel and France’s President Emmanuel Macron both reiterated their commitment to a two-state solution, something they said that Trump’s decision now imperiled. Past U.S. presidents have passed on taking a side on the status of Jerusalem, believing that it would crush any dialogue toward peace. It is almost certain that Palestinians would seek recognition of East Jerusalem as their capital in any two-state solution. Pope Francis also voiced concern about the move which, almost more than a political one, is laden with religious implications. Jerusalem is hallowed by Jews, Christians, and Muslims and is a flash point in Israeli-Palestinian relations. “Jerusalem is a unique city, sacred to Jews, Christians, and Muslims, and it has a special vocation to peace," the Pope’s statement read. "I pray to the Lord that such identity be preserved and strengthened for the benefit of the Holy Land, the Middle East, and the entire world." While Trump is the first U.S. President to recognize Israel’s capital, he is not the first to have promised to do so. The U.S. Congress officially recognized Jerusalem as the Israeli capital in 1995 and pledged to move the embassy there by 1999. Since 1995, however, every president has delayed moving the embassy citing national security concerns beginning with President Clinton, despite campaign promises to do so by some. Palestinian Authority President, Mahmoud Abbas, said he saw Trump’s decision as a withdrawal from the Middle East peace process—a situation Trump campaigned on and promised he would devote attention to. “The U.S. administration with this statement has chosen to go against all the international and bilateral agreements, and to ignore the international consensus," Abbas said. Israel gained control of East Jerusalem during the 1967 War with Syria, Egypt, and Jordan; the western half of Jerusalem was captured in the 1948 Arab-Israeli war. Abbas also said that the U.S. could no longer serve as a mediator in the conflict and that Jerusalem is the “eternal capital of the State of Palestine.” Hamas called for three days of rage in reaction to the move and said Trump made the biggest mistake of his life. President Trump’s statement did not come as a surprise to many as rumors swirled days in advance that he would make this decision. Also unsurprising are the security threats, as warned by many of the president’s critics. Close to fifty U.S. embassies have issued travel warnings, a number not seen since the early years of the Iraq War. Also aware of the potential for violence, the Israeli Defense Forces’ Galilee Division launched a surprise drill on Tuesday simulating an escalation along Israel’s northern border with Lebanon and Syria. The IDF stated that a military drill of this scale had not taken place for more than twenty-five years. Protests have already broken out in Palestinian territories as protestors rally against the decision and burn photos of Trump in the street. A strong force behind the embassy change and standing behind Trump during his speech is Vice-President Mike Pence who is set to visit the region in the coming weeks. Despite the turmoil instigated by this move and the apparent damage to any peace talks, Trump said he is still committed to reaching a resolution in the region. Trump concluded his speech by asking God to bless Israel, the Palestinians, and the United States.